Arequipa is famous for its statuesque white buildings in the colonial area of the city that give it the moniker ‘The White City of Arequipa‘. While most visitors concentrate their time there, few realise that you can see where these big, white stones come from by visiting La Ruta del Sillar, or The Sillar Route, on the outskirts of the city. 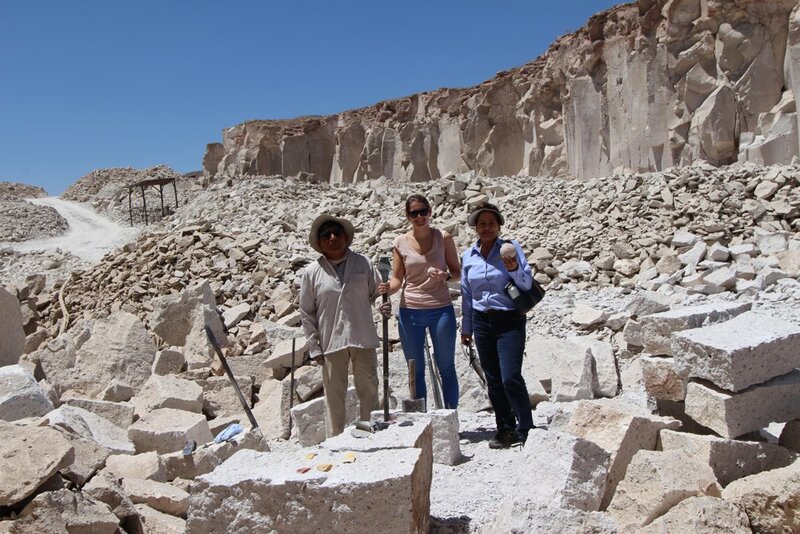 This quarry visit can easily be included on a full day tour of Arequipa. Aracari arranges private, tailormade tours of Arequipa as part of any tailormade trip Peru. Sillar is the whitish-pink volcanic rock that is common in the Arequipa region. Dating back to Colonial days, the rock was used to build casonas, churches and public buildings – like the churches and principal square in Arequipa’s centre. Admiring all the historic buildings is part of the charm of visiting Arequipa. La Ruta del Sillar (The Sillar Route) is a project started by the Centro de Investigación de Educación y Desarrollo (CIED) to increase tourism in the area and spread knowledge about the history of sillar in Arequipa, a UNESCO World Heritage City, giving the opportunity for visitors to the region to see Sillar produced at its source. The route is composed of canteras, or quarries, located in between the three districts of Cerro Colorado, Uchumayo and Yura. The most important quebrada, or ravine, is called Añashuayco, the beginning of the touristic route, housing 7 of the 17 active quarries located in Arequipa. Check out our Highlights of Southern Peru itinerary to inspire a trip to Arequipa! Reaching the Sillar Route quarry takes approximately 30-40 minutes one-way driving from Arequipa. 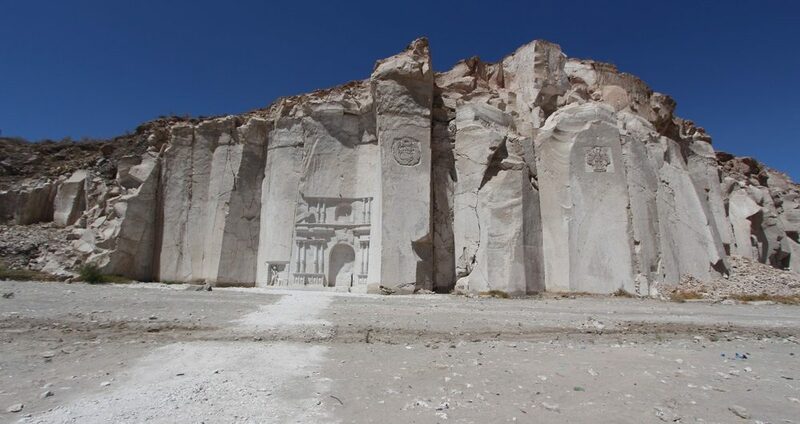 On arrival, you can see where the quarry workers have replicated the facade of the Church of the Company of Jesus, a landmark in Arequipa’s historic city centre, artistically carving it into the wall of the ravine. From here I walked along the quarry to meet the workers. While factory production of sillar has reduced the number of works that choose to pass on their skill from generation to generation, there are still some 50-odd maestros canteros, or quarry-men, who continue to work just as their fathers and grandfathers did before them. 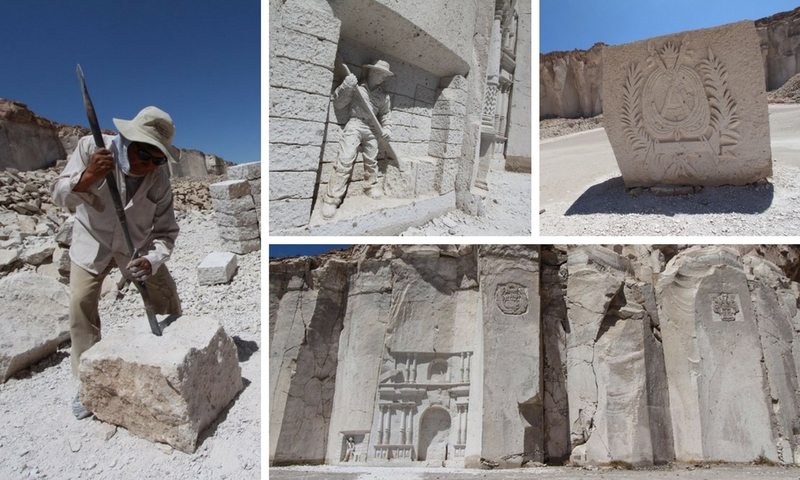 I had the chance to meet with 56-year old Mr. Eusebio Núñez, who explained with care and interest about his job, life in the quarry and the process of creating, by hand, perfectly-shaped white stone slabs using only basic tools. He is paid 6 soles for each piece of large volcanic sillar he shapes. As part of the project designed and financed by CIED, the quarry workers have been trained as guides to give visitors the opportunity to view a demonstration of the traditional methods of extracting the sillar rock, using a sledge hammer and chisel. The quarry-men continue to extract sillar for construction purposes, and these days the demand primarily comes from new towns that are developing in the Arequipa region. La Ruta del Sillar tour also covers the Quebrada de Culebrillas, a windy otherworldly path in between curvaceous volcanic rock caused by eruptions, water and wind. No extraction of sillar has taken place here. In fact, it is so pure that petroglyphs thought to date back to the Wari period can be seen, carved into the sillar ravine walls. To experience the fascinating Ruta del Sillar for yourself, contact us or email travel@aracari.com to arrange a tour while visiting Arequipa and the Colca Canyon.